Walk down Piccadilly approach to Piccadilly Gardens and walk through Market Street. Stay on Market Street for approximately 5 minutes and then turn left onto Cross Street. Take the second road on the right onto King Street. Walk down King Street for 100 metres and on the right hand side is Hermes. 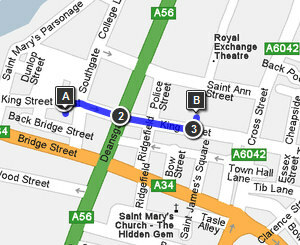 Turn right immediately after into St Ann’s Passage. Lucinda Ellery's Manchester entrance is located in between Hancock's Jewellery through St Ann's passage off King Street. Hermès can be seen opposite Hancock's Jewellery. When you enter the Old Exchange in St Ann's passage, 'Lucinda Ellery Consultancy', is clearly marked on a wooden board where you will be required to ring a door bell and walk up stairs or take the lift as we are on the first floor. TM Lewin is directly opposite the Old Exchange Building. Depart on King Street West and cross over Deansgate Road. Continue onto King Street Walk down King Street for 100 metres and on the right hand side is Hermes. The Lucinda Ellery entrance is on the left inside St Ann’s Passage.